Nocturnal Journal - ZineWiki - the history and culture of zines, independent media and the small press. Nocturnal Journal is a zine by Torben Röse. 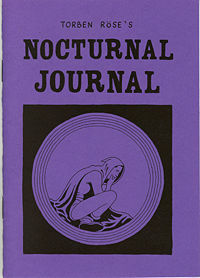 Nocturnal Journal was published in Cologne, Germany in 2012. Every copy comes with a sticker: NOTHING IS BUILT TO LAST. The cover shows Röse's contemplative version of Green Lama, a pulp magazine hero of the 1940s. In March 2014 Röse published the companion piece HAHA! witch was released on the occasion of St. Patrick's Zine Library 2014. Both zines are included in the collection of the St. Patrick's Zine Library. Previously, Torben Rose had published the science fiction fanzine Janx and, with Patrick Rieve, released the zine Ace of Space, which included Rose's drawings. It was released on the occasion of the exhibition with the same title at the BeSt-Kunstraum in Essen, Germany in 2011. This page was last modified on 3 April 2014, at 13:13.